Fried rice is one of the most popular Asian menu items, and no Asian restaurant is complete without this menu choice. Fried rice is a simple dish to prepare, but there are a few important tips and tricks that must be implemented to achieve the right consistency and flavor. The key to preparing high quality fried rice is almost entirely in the way you prepare the white rice for frying. Fried rice must be prepared with rice that has been cooked several hours before the frying process. If rice is not allowed to sit and absorb the moisture present during the boiling process, the rice will be far too wet to fry effectively. One of the most important qualities of good fried rice is the crispy outer shell of the rice kernels. If there is too much moisture in the rice, this crispiness cannot be achieved before the rice burns. Make a large supply of white rice several hours before it is fried, and put the white rice in a stainless steel bowl in a cool location such as a refrigerator. While every chef will likely have his or her own secrets for preparing high quality fried rice, there are a few ingredients that must be present. For flavor, chefs usually add a combination of soy sauce and garlic butter. This brings out the natural nuttiness of the rice while simultaneously complementing the vegetables found in this dish. Egg is a binding agent that is added halfway through the cooking process. 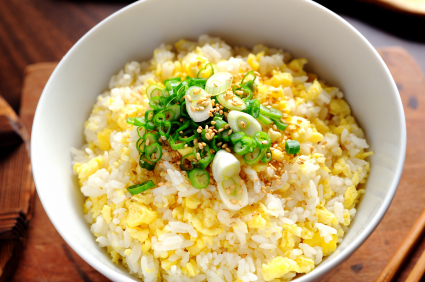 The egg holds the rice together and gives it a richer flavor. Finally, vegetables such as onion, celery, carrot, bell pepper, or water chestnut are added to the fried rice for added flavor and texture. While fried rice can be a meal in and of itself, it is often served alongside a protein dish such as chicken, beef, or fish. Fried rice is considered a flavorful addition to many Asian menu items, so you should be prepared to offer this dish as a side item. If a consumer orders fried rice as a meal, you may choose to offer a larger portion and mix this with meat such as chopped chicken, sliced beef, or fried shrimp. Typically, fried rice is served with sauces such as sweet and sour sauce or soy sauce. This way, the consumer can add sweet flavor or salty flavor, depending on his or her preference. Mastering this classic Asian dish is a very important part of running a successful Asian restaurant. Children often order fried rice because it is familiar looking and comforting. Adults who might hesitate to try more exotic dishes, will often choose fried rice for the very same reasons. Because fried rice is such an inexpensive dish to prepare, it can represent a huge profit potential for your Asian restaurant. Ensuring that fried rice has a crispy texture and an abundance of flavor will keep customers returning for this classic dish.